“In 1856, Giuseppe Verdi accepted an invitation from the General Administrator of the Paris Théâtre de l'Opéra to prepare a French-language version of his wildly popular IL TROVATORE. For his efforts Verdi was paid an amount commensurate with the composition of an entirely new work. Verdi selected Emilien Pacini to author a French translation of Salvatore Cammarano’s original Italian libretto. The successful premiere of Verdi’s LE TROUVÈRE took place at the Salle Le Péletier on 12 January, 1857. Fifty-five years later, a group of distinguished French artists recorded Verdi's LE TROUVÈRE for Pathé. 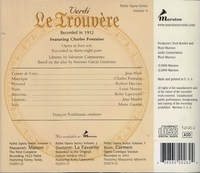 Marston, who has already reissued the Pathé CARMEN and LA FAVORITE on compact disc, now adds LE TROUVÈRE to its catalogue. This is an important release for many reasons. First, it affords the listener the opportunity to hear Verdi's own adaptation of one of his great Italian operas for the French stage. Quite often translations of operas evoke the image of the proverbial ‘square peg in the round hole’, as the original rhythms and melodies are distorted in order to fit the new text. However, since Verdi worked directly with Pacini, the wedding of the music to the French text is natural and idiomatic. To be sure, this quintessential Italian opera takes on a different character when performed in French. It should also be noted that the music for LE TROUVÈRE is no mere carbon copy of IL TROVATORE. There are numerous small modifications to the vocal and orchestral lines. By far the most noticeable changes occur in the opera's final two acts. At the request of the Opéra's management, Verdi composed a ballet, to be performed after the Soldier's Chorus in Act III. Perhaps even more striking are the modifications to the opera's conclusion. In the original version, Manrico is whisked off to his execution immediately after the death of Leonora. Azucena awakens just in time to witness the death of Manrico and to then inform the horrified Count di Luna that the Troubadour was his brother. The entire episode lasts about fifty seconds. In LE TROUVÈRE, Verdi extends this sequence by some thirty bars that feature a reprise of the ‘Miserere’, as well as additional music for Azucena and Manrico. But the merits of the recording extend far beyond academic considerations. This LE TROUVÈRE offers a performance of considerable stature. Each of the principals - important exponents of French opera in the early part of this century - acquit themselves with distinction. Belgian tenor Charles Fontaine is an outstanding Manrico. Fontaine is a bit shaky at his entrance, and lacks the trills for ‘Ah, sì, ben mio’. With the exception of those blemishes, he is just about all one could hope for. The voice radiates admirable warmth and power throughout its range, all the way up to a pair of ringing high ‘Cs’ in ‘Di quella pira’. Fontaine also nicely differentiates the various aspects of Manrico's personality - the loyal son, the lover, and the warrior. Perhaps the star of this recording is yet another Belgian artist, baritone Jean Noté, who offers a sterling Conte di Luna. Noté's attractive, masculine high baritone negotiates the punishing tessitura of this role with remarkable ease. Additionally, Noté manages to make di Luna both elegant and fearsome, an entirely appropriate characterization for the nobleman who is obsessed by love and the desire for revenge. I would definitely place Noté's di Luna alongside Leonard Warren's classic 1952 RCA account as the best I have heard. Soprano Jane Morlet possesses the beauty of voice and agility needed to do full justice to the demanding role of Leonora. And, as with her male colleagues, Morlet is able to provide elegance and passion where appropriate. Mezzo-soprano Ketty Lapeyrette, the Léonore on the classic 1912 Pathé recording of Donizetti's LA FAVORITE, is the Azucena. Her interpretation may be a bit more refined than the norm, but I don't find that to be a drawback, particularly in light of her sterling vocalism. Ward Marston has done a typically superb job of transferring the Pathé discs, notorious for their problematic sonics. Voices emerge with admirable presence. Not surprisingly, there is little in the way of instrumental detail. Still, it is possible to discern the admirable collaboration between the vocalists and conductor François Ruhlmann, who allows the singers ample time to make their individual points without disrupting the music's flow. Indeed, the liberal yet judicious application of rubato throughout offers an important window to a style of performance whose current absence is lamentable. “Charles Fontaine, a Belgian tenor who was born in Antwerp on 24 May 1878, studied at the Brussels Conservatory, then made his opera début in the season of 1903–1904 at the Théâtre Royal Français in The Hague, where he sang Don José, Faust, Julien, Des Grieux and other roles. His first London appearance was at Covent Garden in 1909, when he was Samson in theater’s first staged performance of SAMSON ET DALILA; other assignments there were Faust and Armide. Fontaine’s Paris Opéra debut followed on 7 July 1911, when he sang Raoul in LES HUGUENOTS. He remained a leading artist with that company until 1930, singing the operas of many composers, from Rossini to Wolf-Ferrari. Henri Dangès (1870-1948) - Dangès had an extensive career in Paris as well as the French provinces. He first appeared at the Opéra-Comique in 1898 and sang there from 1900-1902. From 1908 onwards, he primarily sang at the Paris Opéra, making his début as Valentin in FAUST. He also appeared at Monte Carlo and Lyon. He is listed as having sung with the Boston Opera, 1911-1912 and performing in Amsterdam as Morales in 1928. Marcelle Demougeot (1876-1931) - Demougeot studied in Dijon with Charles Laurent and at the Paris Conservatory. She made her début at the Paris Opéra as Donna Elvira in DON GIOVANNI. She sang in two world premieres and in 1911 sang Fricka in the first performance of the Paris Opéra production of DAS RHEINGOLD. Demougeot was considered one of the foremost French Wagnerian sopranos of her day. Léon Escalaïs (1859-1941) - Escalaïs studied at the conservatories in Toulouse and Paris, then made his début at the Paris Opéra as Arnold in GUILLAUME TELL. In 1890 he appeared at the Opéra in the premiere of ZAÏRE. He appeared regularly at the Théâtre de la Monnaie and toured throughout Europe and the U.S.
Lucette Korsoff (1876-1955) - Korsoff was born in Italy of Russian parents. At sixteen, she performed with a Russian opera troupe of which her father was a member. She studied with Frédéric Boyer in Paris and sang the role of Marie in the Brussels Opera's production of THE BARTERED BRIDE in 1905. She also appeared at the Opéra-Comique, New Orleans Opera, Boston Opera and Monte Carlo Opera. She was a coloratura soprano with technique to spare and a beautiful tone. She was particularly admired as the Queen of the Night. Juste Nivette (1866-?) - Nivette débuted at the Opéra-Comique as Sarastro in DIE ZAUBERFLÖTE in 1892. He appeared in such diverse roles as Marcel in LES HUGUENOTS, Walter in GUILLAUME TELL, Ferrando in IL TROVATORE and Fafner in SIEGFRIED. He sang in the premiere of Massenet's LE JONGLEUR DE NOTRE DAME in Monte Carlo and appeared at the opening of the Boston Opera, 1909, as Alvise in LA GIOCONDA."